You've carefully compiled your "keepers" into playlists and bookmarks, only to discover they are gradually falling off the internet. Publishers can stop hosting their content, move them away, or run into temporary downtime. That's no longer a problem with Player FM's backup feature. Our servers automatically make a personal backup of all playlist and bookmark items so you can just play them seamlessly even if the original source is down. When you attempt to play from the app or website and the app encounters an error, it will revert to your backup. Similarly, you can download the backup anytime, accessing your unique backup location from the Links dialog. What kind of podcasts are eligible for Backup? There's a size limit of 500MB; if the publisher's file exceeds this limit, the episode will not be backed up. We'll also honor any takedown notices from publishers, though we anticipate those to be rare as most likely, episodes are removed simply because the publisher deletes them or stops hosting the podcast. How many episodes can I back up? Backup is unlimited, subject to fair use. As long as you're adding playlist items in a typical way, it shouldn't be a problem, e.g. several items a day on average. We want to keep this as simple as possible, but full media backup has serious hosting costs for us, so we have to ensure usage is reasonable and would question your usage if you're regularly adding hundreds of items a month. Will my playlists be backed up if I created them before upgrading? Yes - to keep things simple, all your current playlists will be fully backed up within a few hours of your upgrade. Of course, episodes can only be backed up if they are still online at the time you upgrade. We limit this initial backup to the 100 latest items in each playlist, for up to 10 playlists. If you have a very long playlist and want to back up certain earlier episodes, a simple trick is to move them to the top. Our support team can help with this too. How can I check if an episode is backed up? 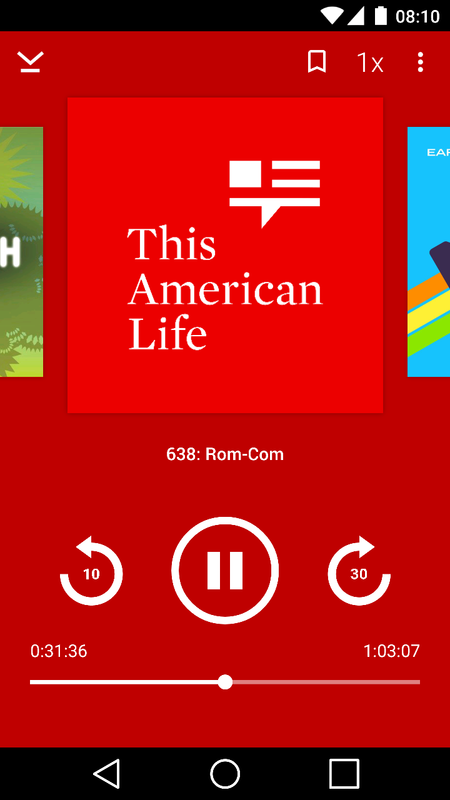 On the Android app, simply access the episode detail screen and open the "Links" dialog. There, you'll be able to view your personal media link and download it. Can I share backups with other users? No. It's designed as a personal backup for your playlists, having the same effect as if you had downloaded the episode. To respect publishers' rights, the links to backup media are generated only on demand, they are personalized and expiring. Is the file altered for storage purposes? The backed up file will typically be stored in the same format as the source, but may be subject to lossy audio compression, in order to reduce storage size. You shouldn't typically notice any difference from this compression when it comes to speech-based media. How does the app use backups? The backup mechanism is seamlessly integrated into the app. 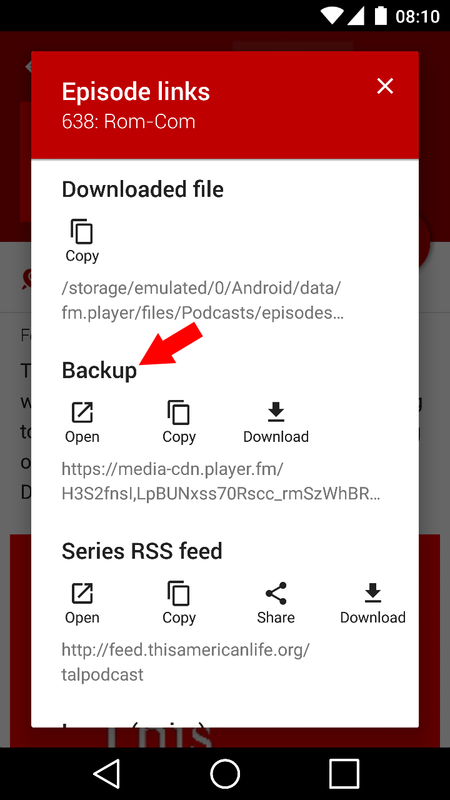 This means if you try to play an episode on web or Android, and it's not present online, the app will revert to the backed up media instead. Furthermore, if you have any kind of rules set up to download the episode, e.g. it's a recent item in your subscriptions, the app will also use the backed up media in the event the episode is no longer online. You can also download your backup directly via the Links dialog.